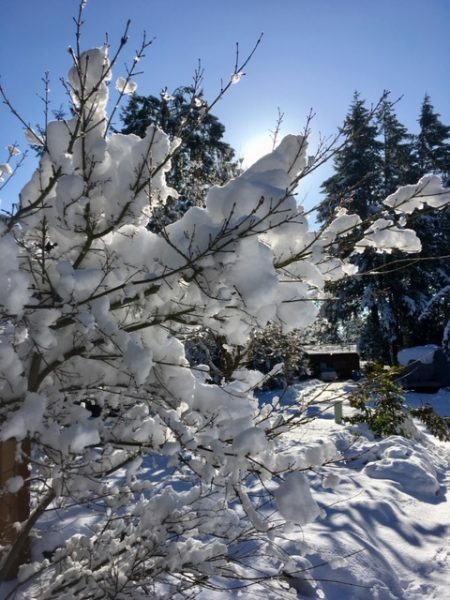 Sunday, February 10, 2019 + Fifth Sunday after Epiphany + St. Mark Snow Day! We hope you enjoyed a peaceful, warm, snowy morning. We missed worshiping with you today! While the sun was shining, we took a leisurely walk through the glorious winter wonderland. During our walk, we offered prayers of thanks, prayers of comfort, and prayers of peace for you. Although we didn’t get to gather TOGETHER for worship, we would like to share some thoughts with you. All these lessons remind us: We are God’s imperfect people! We may find ourselves wondering (well, I confess I wonder about myself! ), why has God entrusted such an important mission to someone like me?! These readings remind me that God’s prophets and apostles felt the same concerns. Isaiah declares, “I am a man of unclean lips.” Paul asserts, “I am the least of the apostles, unfit to be called an apostle, because I persecuted the church of God.” Peter responds to Jesus’ miracle of plenty by saying, “Go away from me, Lord, for I am a sinful man!” Yet, without question, God used these flawed and fragile human beings to proclaim God’s mercy and love–not only through their words, but even more significantly, through their lives of love. Marketing media and advertising tell us over and over that we are insufficient— we do not have enough, look enough, know enough, or matter enough. Why in the world does God place such trust in us?!! It is no coincidence that before Jesus calls Peter, James, and John to discipleship he performs a miracle pointing to God’s abundant mercy and grace. God gives us what we need–and more–to be faithful. Jesus meets us at the shorelines of our own lives, going about our daily work, and calls us to lifelong discipleship. Caught up in God’s abundant grace, and fed out of that bounty, we are commissioned to go catch others with the very love of God. Go in peace to love and serve the Lord. Thanks be to God!